A Breakthrough in High-Pressure Physics? Image of a diamond anvil cell compressing molecular hydrogen. At 4.95 million atmospheres, the sample converts to metallic hydrogen, as shown on the right. ­­Two Harvard scientists believe they have produced metallic hydrogen. Their feat, which has eluded physicists for more than 80 years, would mark an important breakthrough in physics, not only because it demonstrates a fundamental new property of the most abundant element in the universe, but because the metallic form is predicted to remain a superconductor at room temperature. If that turns out to be true, and an efficient means of producing it can be devised, the applied uses of metallic hydrogen could be transformative: superconductors, for example, transmit electricity without resistance and could be used to create lossless, superconducting magnetic storage for the electrical grid, and frictionless maglev trains. Space travel, too, could be fundamentally changed, because the substance’s predicted properties as a rocket fuel would open even the most distant planets in the solar system to exploration. Isaac Silvera, Cabot professor of the natural sciences, who has been working on this problem for 45 years, and Ranga Dias, a postdoctoral fellow, reported their results in today’s issue of Science. Photos of compressed hydrogen transitioning with increasing pressure from transparent molecular to black molecular to atomic metallic hydrogen. Diamonds, including the nearly perfect synthetic specimens used in the anvil, are the hardest substances on Earth, but at the pressures needed to create metallic hydrogen—almost 5 million atmospheres—they frequently break. The researchers therefore had to overcome three principal causes of these experiment-ending fractures. Minute surface imperfections can cause the gems to break along the flaws, the way window glass breaks where it has been scored. “A polished diamond under a microscope looks beautiful,” Silvera explained in an interview, “but if you use atomic force microscopy, you see little defects. And if that is on the culet, the part that is pushing on the hydrogen, and it is highly stressed, it can break there.” His research group was able to etch away these nanoscale imperfections using a reactive ion etching technique available through Harvard’s Center for Nanoscale Systems. A second problem has to do with the hydrogen molecule itself. Hydrogen is “the simplest and most fundamental atom, a single proton with an electron,” Silvera pointed out. And because it is so small, it can actually diffuse, even in the molecular form, under the intense pressures created in the anvil, into the molecular crystalline lattice of the diamonds themselves, breaking them apart. The researchers responded by coating the stones with a thin layer of alumina, which acts as a diffusion barrier against hydrogen. Silvera also knew that diamonds become brittle when exposed to laser light under high pressure: a colleague at Cornell, Arthur Ruoff, had told him about breaking 15 sets of diamonds by shining lasers into them to study the properties of hydrogen at about 3.5 million atmospheres of pressure. So Silvera and Dias, operating at even higher pressures, took care never to shine a high-power laser into their sample. Several physicists have expressed skepticism about the results reported in Science. Because such experiments use a metal gasket to hold the solid hydrogen in place within the diamond anvil cell, that metal could have contaminated the sample, they say, causing the reflectance. But Silvera said that measurements of the reflectance of the gasket and of the center of the sample suggest that the hydrogen is pure. Another potential source of contamination is the aluminum oxide used to coat the diamonds as a diffusion barrier. If it behaves differently under high pressure, critics say, that could have caused the observed reflectance, rather than the creation of a new metal. But Silvera counters that studies of alumina at a variety of temperatures and pressures indicate otherwise. Even its reduced, metallic form of alane is transparent at high pressure, he points out, adding that his group has remained able to photograph the gasket and sample through the alumina coating. The transformation of hydrogen gas into metallic hydrogen, known as the Wigner-Huntington transition, was first predicted in 1935. Physicists Hillard Huntington and Eugene Wigner substantially underestimated the pressure required, however; research in recent decades had correctly predicted that pressures on the order of 4 to 5 million atmospheres would be necessary. Modern theoretical physicists agree with their predecessors’ conclusions about other aspects of the transformation, however. In particular, they believe that the hydrogen will remain a metal even after the pressure is released—that metallic hydrogen is metastable, or stable in a manner similar to a diamond, which can be formed by subjecting graphite to high pressures. Once the transformation from graphite to diamond (both pure carbon, but with different molecular structures) has occurred, the diamond will revert to graphite only if subjected to high temperatures. That means the substance would have important applications for energy conservation. “Let’s say you could make wires out of superconducting metallic hydrogen,” Silvera speculated. “Then if you transport energy, you would have no dissipation because it doesn't have resistance. Right now, in our electrical grid we lose energy just by heating up the wire during transmission.” Such a substance could also replace the magnets now used in MRIs, which require liquid-helium cooling. 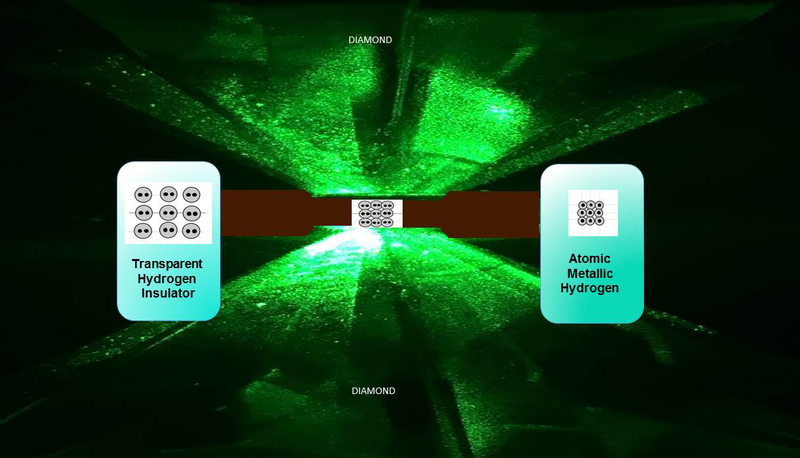 If metallic hydrogen behaves as predicted, it would work both at room temperature and higher temperatures. Another potential electrical application, said Dias, would be the creation of superconducting magnetic storage, which “maintains persistent currents in superconducting coils.” That would be especially helpful for maintaining equilibrium in the electrical grid, by leveling power production from renewable sources such as wind and solar, which produce electricity intermittently. “The most romantic application of superconductivity,” Dias continued, would be “magnetic levitation of high-speed trains, based on the perfect diamagnetism of superconductors,” which creates a repulsive magnetic force. That would revolutionize transportation. Updated January 27 to reflect reaction to the announcement.